Liczba stron: 323 Jest to ujednolicona liczba stron, która ułatwi Ci porównanie długości książek. Każda strona Legimi to 200 słów. In this first of Jacobs collections, many of the 43 tales will be familiar. Included are 'Jack and the Beanstalk, ' 'The Story of the Three Bears, ' and others.About the AuthorJoseph Jacobs (29 August 1854 - 30 January 1916) was a folklorist, literary critic and historian. His works included contributions to the Jewish Encyclopedia, translations of European works, and critical editions of early English literature. Jacobs wrote for journals and books on the subject of folklore and produced a popular series of fairy tales. 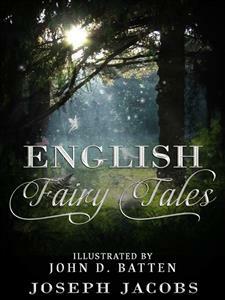 WHO says that English folk have no fairy tales of their own? The present volume contains only a selection out of some 140, of which I have found traces in this country. It is probable that many more exist. A quarter of the tales in this volume have been collected during the last ten years or so, and some of them have not been hitherto published. Up to 1870, it was said equally of France and of Italy, that they possessed no folk-tales. Yet, within fifteen years from that date, over 1000 tales had been collected in each country. I am hoping that the present volume may lead to equal activity in this country, and would earnestly beg any reader of this book who knows of similar tales, to communicate them, written down as they are told, to me, care of the Publishers. The only reason, I imagine, why such tales have not hitherto been brought to light, is the lamentable gap between the governing and recording classes and the dumb working classes of this country--dumb to others but eloquent among themselves. It would be no unpatriotic task to help to bridge over this gulf, by giving a common fund of nursery literature to all classes of the English people, and, in any case, it can do no harm to add to the innocent gaiety of the nation. A word or two as to our title seems necessary. We have called our stories Fairy Tales though few of them speak of fairies. [For some recent views on fairies and tales about fairies, see Notes] The same remark applies to the collection of the Brothers Grimm and to all the other European collections, which contain exactly the same classes of tales as ours. Yet our stories are what the little ones mean when they clamour for 'Fairy Tales', and this is the only name which they give to them. One cannot imagine a child saying, 'Tell us a folk-tale, nurse', or 'Another nursery tale, please, grandma'. As our book is intended for the little ones, we have indicated its contents by the name they use. The words 'Fairy Tales' must accordingly be taken to include tales in which occurs something 'fairy', something extraordinary--fairies, giants, dwarfs, speaking animals. It must be taken also to cover tales in which what is extraordinary is the stupidity of some of the actors. Many of the tales in this volume, as in similar collections for other European countries, are what the folklorists call Drolls. They serve to justify the title of Merrie England, which used to be given to this country of ours, and indicated unsuspected capacity for fun and humour among the unlettered classes. The story of Tom TitTot, which opens our collection, is unequalled among all other folk-tales I am acquainted with, for its combined sense of humour and dramatic power. The first adjective of our title also needs a similar extension of its meaning. I have acted on Moliere's principle, and have taken what was good wherever I could find it. Thus, a couple of these stories have been found among descendants of English immigrants in America; a couple of others I tell as I heard them myself in my youth in Australia. One of the best was taken down from the mouth of an English Gipsy. I have also included some stories that have only been found in Lowland Scotch. I have felt justified in doing this, as of the twenty-one folk-tales contained in Chambers' Popular Rhymes of Scotland, no fewer than sixteen are also to be found in an English form. With the folk-tale as with the ballad, Lowland Scotch may be regarded as simply a dialect of English, and it is a mere chance whether a tale is extant in one or other, or both. I have also rescued and retold a few Fairy Tales that only exist nowadays in the form of ballads. There are certain indications that the 'common form' of the English Fairy Tale was the cante-fable, a mixture of narrative and verse of which the most illustrious example in literature is Aucassin et Nicolette. In one case, I have endeavoured to retain this form, as the tale in which it occurs, Childe Rowland, is mentioned by Shakespeare in King Lear, and is probably, as I have shown, the source of Milton's Comus. Late as they have been collected, some dozen of the tales can be traced back to the sixteenth century, two of them being quoted by Shakespeare himself. In the majority of instances I have had largely to re-write [It is perhaps worth remarking that the Brothers Grimm did the same with their stories. 'Dass der Ausdruck', say they in their Preface, 'mid die Ausführung des Einzelnen grossentheils von uns herrührt versteht sich von selbst'. I may add that many of their stories were taken from printed sources.] these Fairy Tales, especially those in dialect, including the Lowland Scotch. Children, and sometimes those of larger growth, will not read dialect. I have also had to reduce the flatulent phraseology of the eighteenth-century chap-books, and to rewrite in simpler style the stories only extant in 'Literary' English. I have, however, left a few vulgarisms in the mouths of vulgar people. Children appreciate the dramatic propriety of this as much as their elders. Generally speaking, it has been my ambition to write as a good old nurse will speak when she tells Fairy Tales. I am doubtful as to my success in catching the colloquial-romantic tone appropriate for such narratives, but the thing had to be done or else my main object, to give a book of English Fairy Tales which English children will listen to, would have been unachieved. This book is meant to be read aloud, and not merely taken in by the eye. In a few instances I have introduced or changed an incident. I have never done so, however, without mentioning the fact in the Notes. These have been relegated to the obscurity of small print and a back place, while the little ones have been, perhaps unnecessarily, warned off them. They indicate my sources and give a few references to parallels and variants which may be of interest to fellow-students of Folk-lore. It is, perhaps, not necessary to inform readers who are not fellow-students that the study of Folk-tales has pretensions to be a science. It has its special terminology, and its own methods of investigation, by which it is hoped, one of these days, to gain fuller knowledge of the workings of the popular mind as well as traces of archaic modes of thought and custom. I hope on some future occasion to treat the subject of the English Folk-tale on a larger scale and with all the necessary paraphernalia of prolegomena and excursus. I shall then, of course, reproduce my originals with literal accuracy, and have therefore felt the more at liberty on the present occasion to make the necessary deviations from this in order to make the tales readable for children. Finally, I have to thank those by whose kindness in waiving their rights to some of these stories, I have been enabled to compile this book. My friends, Mr E. Clodd, Mr F. Hindes Groome, and Mr Andrew Lang, have thus yielded up to me some of the most attractive stories in the following pages. The Councils of the English and of the American Folklore Societies, and Messrs Longmans, have also been equally generous. Nor can I close these remarks without a word of thanks and praise to the artistic skill with which my friend, Mr J. D. Batten, has made the romance and humour of these stories live again in the brilliant designs with which he has adorned these pages. It should be added that the dainty headpieces to Henny Penny and Mr Fox are due to my old friend, Mr Henry Ryland. I HAVE taken the opportunity of a fresh issue of this book to revise the phraseology and bring the Notes, as far as possible, up to date. The remarkable cordiality with which the book has been received by readers, young and old, has laid upon me the obligation of making it as worthy as possible of such a kind reception. 'Darter,' says she, 'put you them there pies on the shelf, and leave 'em there a little, and they'll come again.' - She meant, you know, the crust would get soft. But the girl, she says to herself: 'Well, if they'll come again, I'll eat 'em now.' And she set to work and ate 'em all, first and last. The girl went and she looked, and there was nothing but the dishes. So back she came and says she: 'Noo, they ain't come again.' 'Not one of 'em?' says the mother. 'Not one of' 'em,' says she. 'But you can't, if they ain't come,' said the girl. 'My darter ha' ate five, five pies today. 'My darter ha' spun five, five skeins today. 'All right,' says the woman; for she thought what a grand marriage that was. And as for the five skeins, when the time came, there'd be plenty of ways of getting out of it, and likeliest, he'd have forgotten all about it. Well, she was that frightened, she'd always been such a gatless girl, that she didn't so much as know how to spin, and what was she to do tomorrow with no one to come nigh her to help her? She sate down on a stool in the kitchen, and law! how she did cry! 'What's that to you?' says she. 'Never you mind,' that said, 'but tell me what you're a-crying for.' 'That won't do me no good if I do,' says she. 'You don't know that,' that said, and twirled that's tail round. 'Well,' says she, 'that won't do no harm, if that don't do no good,' and she upped and told about the pies, and the skeins, and everything. 'This is what I'll do,' says the little black thing. 'I'll come to your window every morning and take the flax and bring it spun at night.' 'What's your pay?' says she. 'All right,' that says, and law! how that twirled that's tail. 'Now, there's the flax,' says he, 'and if that ain't spun up this night, off goes your head.' And then he went out and locked the door. He'd hardly gone, when there was a knocking against the window. 'Where's the flax?' says he. 'Here it be,' says she. And she gave it to him. 'Here it be,' says he, and he gave it to her. 'Now, what's my name?' says he. 'What, is that Bill?' says she. 'Noo, that ain't,' says he, and he twirled his tail. 'Is that Ned?' says she. 'Noo, that ain't,' says he, and he twirled his tail. 'Well, is that Mark?' says she. 'Noo, that ain't,' says he, and he twirled his tail harder, and away he flew. Well, when her husband came in, there were the five skeins ready for him. 'I see I shan't have to kill you tonight, my dear,' says he; 'you'll have your food and your flax in the morning,' says he, and away he goes. Well, every day the flax and the food were brought, and every day that there little black impet used to come mornings and evenings. And all the day the girl sate trying to think of names to say to it when it came at night. But she never hit on the right one. And as it got towards the end of the month, the impet began to look so maliceful, and that twirled that's tail faster and faster each time she gave a guess. At last it came to the last day but one. The impet came at night along with the five skeins, and that said: 'What, ain't you got my name yet?' 'Is that Nicodemus?' says she. 'Noo, 't ain't,' that says. 'Is that Sammle?' says she. 'A-well, is that Methusalem?' says she. 'Noo, 't ain't that neither,' that says. Then that looks at her with that's eyes like a coal of fire, and that says: 'Woman, there's only tomorrow night, and then you'll be mine!' And away it flew. 'Well, my dear,' says he. 'I don't see but what you'll have your skeins ready tomorrow night as well, and as I reckon I shan't have to kill you, I'll have supper in here tonight.' So they brought supper, and another stool for him, and down the two sate. Well, he hadn't eaten but a mouthful or so, when he stops and begins to laugh. 'What is it?' says she. 'A-why,' says he, 'I was out a-hunting today, and I got away to a place in the wood I'd never seen before. And there was an old chalk-pit. And I heard a kind of a sort of humming. So I got off my hobby, and I went right quiet to the pit, and I looked down. Well, what should there be but the funniest little black thing you ever set eyes on. And what was that doing, but that had a little spinning-wheel, and that was spinning wonderful fast, and twirling that's tail. Well, when the girl heard this, she felt as if she could have jumped out of her skin for joy, but she didn't say a word. Next day that there little thing looked so maliceful when he came for the flax. And when night came she heard that knocking against the window panes. She oped the window, and that come right in on the ledge. That was grinning from ear to ear, and Oo! that's tail was twirling round so fast. 'What's my name?' that says, as that gave her the skeins. 'Is that Solomon?' she says, pretending to be afeard. 'Noo, 'tain't,' that says, and that came further into the room. 'Well, is that Zebedee?' says she again. 'Noo, 'tain't,' says the impet. And then that laughed and twirled that's tail till you couldn't hardly see it. 'Take time, woman,' that says; 'next guess, and you're mine.' And that stretched out that's black hands at her. ONCE upon a time there was a farmer and his wife who had one daughter, and she was courted by a gentleman. Every evening he used to come and see her, and stop to supper at the farmhouse, and the daughter used to be sent down into the cellar to draw the beer for supper. So one evening she had gone down to draw the beer, and she happened to look up at the ceiling while she was drawing, and she saw a mallet stuck in one of the beams. It must have been there a long, long time, but somehow or other she had never noticed it before, and she began athinking. And she thought it was very dangerous to have that mallet there, for she said to herself: 'Suppose him and me was to be married, and we was to have a son, and he was to grow up to be a man, and come down into the cellar to draw the beer, like as I'm doing now, and the mallet was to fall on his head and kill him, what a dreadful thing it would be!' And she put down the candle and the jug, and sat herself down and began a-crying. Well, they began to wonder upstairs how it was that she was so long drawing the beer, and her mother went down to see after her, and she found her sitting on the settle crying, and the beer running over the floor. 'Why, whatever is the matter?' said her mother. 'Oh, mother!' says she, 'look at that horrid mallet! Suppose we was to be married, and was to have a son, and he was to grow up, and was to come down to the cellar to draw the beer, and the mallet was to fall on his head and kill him, what a dreadful thing it would be!' 'Dear, dear! what a dreadful thing it would be!' said the mother, and she sat down aside of the daughter and started a-crying too. Then after a bit the father began to wonder that they didn't come back, and he went down into the cellar to look after them himself, and there they two sat a-crying, and the beer running all over the floor. 'Whatever is the matter?' says he. 'Why,' says the mother, 'look at that horrid mallet. Just suppose, if our daughter and her sweetheart was to be married, and was to have a son, and he was to grow up, and was to come down into the cellar to draw the beer, and the mallet was to fall on his head and kill him, what a dreadful thing it would be!' 'Dear, dear, dear! so it would!' said the father, and he sat himself down aside of the other two, and started a-crying. Now the gentleman got tired of stopping up in the kitchen by himself, and at last he went down into the cellar, too, to see what they were after; and there they three sat a-crying side by side, and the beer running all over the floor. And he ran straight and turned the tap. Then he said: 'Whatever are you three doing, sitting there crying, and letting the beer run all over the floor?' 'Oh!' says the father, 'look at that horrid mallet! Suppose you and our daughter was to be married, and was to have a son, and he was to grow up, and was to come down into the cellar to draw the beer, and the mallet was to fall on his head and kill him!' And then they all started a-crying worse than before. But the gentleman burst out alaughing, and reached up and pulled out the mallet, and then he said: 'I've travelled many miles, and I never met three such big sillies as you three before; and now I shall start out on my travels again, and when I can find three bigger sillies than you three, then I'll come back and marry your daughter.' So he wished them good-bye, and started off on his travels, and left them all crying because the girl had lost her sweetheart. Well, he set out, and he travelled a long way, and at last he came to a woman's cottage that had some grass growing on the roof. And the woman was trying to get her cow to go up a ladder to the grass, and the poor thing durst not go. So the gentleman asked the woman what she was doing. 'Why, lookye,' she said, 'look at all that beautiful grass. I'm going to get the cow on to the roof to eat it. She'll be quite safe, for I shall tie a string round her neck, and pass it down the chimney, and tie it to my wrist as I go about the house, so she can't fall off without my knowing it.' 'Oh, you poor silly!' said the gentleman, 'you should cut the grass and throw it down to the cow!' But the woman thought it was easier to get the cow up the ladder than to get the grass down, so she pushed her and coaxed her and got her up, and tied a string round her neck, and passed it down the chimney, and fastened it to her own wrist. And the gentleman went on his way, but he hadn't gone far when the cow tumbled off the roof, and hung by the string tied round her neck, and it strangled her. And the weight of the cow tied to her wrist pulled the woman up the chimney, and she stuck fast half-way and was smothered in the soot. And the gentleman went on and on, and he went to an inn to stop the night, and they were so full at the inn that they had to put him in a double-bedded room, and another traveller was to sleep in the other bed. The other man was a very pleasant fellow, and they got very friendly together; but in the morning, when they were both getting up, the gentleman was surprised to see the other hang his trousers on the knobs of the chest of drawers and run across the room and try to jump into them, and he tried over and over again and couldn't manage it; and the gentleman wondered whatever he was doing it for. At last he stopped and wiped his face with his handkerchief. 'Oh dear,' he says, 'I do think trousers are the most awkwardest kind of clothes that ever were. I can't think who could have invented such things. It takes me the best part of an hour to get into mine every morning, and I get so hot! How do you manage yours?' So the gentleman burst out a-laughing, and showed him how to put them on; and he was very much obliged to him, and said he never should have thought of doing it that way. Then the gentleman went on his travels again; and he came to a village, and outside the village there was a pond, and round the pond was a crowd of people. And they had got rakes, and brooms, and pitchforks reaching into the pond; and the gentleman asked what was the matter. 'Why,' they say, 'matter enough! Moon's tumbled into the pond, and we can't rake her out anyhow!' So the gentleman burst out a-laughing, and told them to look up into the sky, and that it was only the shadow in the water. But they wouldn't listen to him, and abused him shamefully, and he got away as quick as he could. So there was a whole lot of sillies bigger than them three sillies at home. So the gentleman turned back home and married the farmer' s daughter, and if they didn't live happy for ever after, that's nothing to do with you or me. THERE was once upon a time a good man who had two children: a girl by a first wife, and a boy by the second. The girl was as white as milk, and her lips were like cherries. Her hair was like golden silk, and it hung to the ground. Her brother loved her dearly, but her wicked stepmother hated her. 'Child,' said the stepmother one day, 'go to the grocer's shop and buy me a pound of candles.' She gave her the money; and the little girl went, bought the candles, and started on her return. There was a stile to cross. She put down the candles whilst she got over the stile. Up came a dog and ran off with the candles. The stepmother was angry, but she pretended not to mind the loss. She said to the child: 'Come, lay your head on my lap that I may comb your hair.' So the little one laid her head in the woman's lap, who proceeded to comb the yellow silken hair. And when she combed the hair fell over her knees, and rolled right down to the ground. Then the stepmother hated her more for the beauty of her hair; so she said to her, 'I cannot part your hair on my knee, fetch a billet of wood.' So she fetched it. Then said the stepmother, 'I cannot part your hair with a comb, fetch me an axe.' So she fetched it. Then she took the heart and liver of the little girl, and she stewed them and brought into the house for supper. The husband tasted them and shook his head. He said they tasted very strangely. She gave some to the little boy, but he would not eat. She tried to force him, but he refused, and ran out into the garden, and took up his little sister, and put her in a box, and buried the box under a rose-tree; and every day he went to the tree and wept, till his tears ran down on the box. Then all three cried out with one voice: 'Oh, what a beautiful song! Sing it, sweet bird, again.' 'If you will put the millstone round my neck,' said the bird. The men did what the bird wanted and away to the tree it flew with the millstone round its neck, the red shoes in one foot, and the gold watch and chain in the other. It sang the song and then flew home. It rattled the millstone against the eaves of the house, and the stepmother said: 'It thunders.' Then the little boy ran out to see the thunder, and down dropped the red shoes at his feet. It rattled the millstone against the eaves of the house once more, and the stepmother said again: 'It thunders.' Then the father ran out and down fell the chain about his neck. In ran father and son, laughing and saying, 'See, what fine things the thunder has brought us!' Then the bird rattled the millstone against the eaves of the house a third time; and the stepmother said: 'It thunders again; perhaps the thunder has brought something for me', and she ran out; but the moment she stepped outside the door, down fell the millstone on her head; and so she died. As she was coming home, she came to a stile: but the piggy wouldn't go over the stile. She went a little further, and she met a dog. So she said to him: 'Dog! dog! bite pig; piggy won't go over the stile; and I shan't get home tonight.' But the dog wouldn't. She went a little further, and she met a stick. So she said: 'Stick! stick! beat dog! dog won't bite pig; piggy won't get over the stile; and I shan't get home tonight.' But the stick wouldn't. She went a little further, and she met a fire. So she said: 'Fire! fire! burn stick; stick won't beat dog; dog won't bite pig; piggy won't get over the stile; and I shan't get home tonight.' But the fire wouldn't. She went a little further, and she met some water. So she said: 'Water! water! quench fire; fire won't burn stick; stick won't beat dog; dog won't bite pig; piggy won't get over the stile; and I shan't get home tonight.' But the water wouldn't. She went a little further, and she met an ox. So she said: 'Ox! ox! drink water; water won't quench fire; fire won't burn stick; stick won't beat dog; dog won't bite pig; piggy won't get over the stile; and I shan't get home tonight.' But the ox wouldn't. She went a little further and she met a butcher. So she said: 'Butcher! butcher! kill ox; ox won't drink water; water won't quench fire; fire won't burn stick; stick won't beat dog; dog won't bite pig; piggy won't get over the stile; and I shan't get home tonight.' But the butcher wouldn' t.
She went a little further, and she met a rope. So she said: 'Rope! rope! hang butcher; butcher won't kill ox; ox won't drink water; water won't quench fire; fire won't burn stick; stick won't beat dog; dog won't bite pig; piggy won' t get over the stile; and I shan't get home tonight.' But the rope wouldn't. She went a little further, and she met a rat. So she said: 'Rat! rat! gnaw rope; rope won't hang butcher, butcher won't kill ox; ox won't drink water; water won't quench fire; fire won't burn stick; stick won't beat dog; dog won't bite pig; piggy won't get over the stile; and I shan't get home tonight.' But the rat wouldn't. She went a little further, and she met a cat. So she said: 'Cat! cat! kill rat; rat won' t gnaw rope; rope won't hang butcher; butcher won't kill ox; ox won't drink water; water won't quench fire; fire won't burn stick; stick won't beat dog; dog won't bite pig; piggy won't get over the stile; and I shan't get home tonight.' But the cat said to her, 'If you will go to yonder cow, and fetch me a saucer of milk, I will kill the rat.' So away went the old woman to the cow. But the the cow said to her: 'If you will go to yonder haystack, and fetch me a handful of hay, I'll give you the milk.' So away went the old woman to the hay-stack; and she brought the hay to the cow. As soon as the cat had lapped up the milk, the cat began to kill the rat; the rat began to gnaw the rope; the rope began to hang the butcher; the butcher began to kill the ox; the ox began to drink the water; the water began to quench the fire; the fire began to burn the stick; the stick began to beat the dog; the dog began to bite the pig; the little pig in a fright jumped over the stile; and so the old woman got home that night.